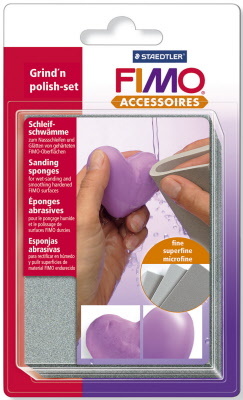 Three sanding sponges for wet sanding and smoothing surfaces of hardened FIMO and other clays. Ideal for sanding round and curved shapes using the smooth foam surface. Can easily be cut to size. Long lasting. Easy to wash for frequent use. Includes three different sanding grades: "Fine", "Super-fine" and "Micro-fine". Size: 95 x 125mm and 5mm deep. NB If gloss varnish is to be used afterwards smoother surfaces give better results.